Amal Clooney is a Lebanese-British legal practitioner who specialized in international law and human rights. She has a number of high profile clients but while she is counted among the big shots in the legal industry, she was not known beyond the legal community until she got married to popular American actor, filmmaker and businessman, George Clooney. The entire Hollywood and fans of George waited for more than twenty years, hoping that he finds another woman who would resurrect his faith in love after his four-year marriage to his first wife, Talia Balsam collapsed in 1993. That woman turned out to be Amal whom he tied the knot with on the 27th of September 2014, at Ca’ Farsetti. Keep reading to find out more interesting information about the actor’s second wife and mother of his twins. The daughter of Ramzi Alam Uddin (father) and Bariaa Miknass (mother) was born on 3 February 1978, in Beirut, Lebanon, as Amal Alamuddin. She got her first name from the Arabic word “amal” which means hope as a result of the existing condition in their country at the time of her birth. According to her mother, things did not go smoothly when she was pregnant with her (Amal). She had placenta praevia and as a result, stayed in the hospital for two months. Despite being advised to lose the baby along the line, she insisted on continuing with the pregnancy and eventually, baby Amal was born at a time when there was a temporary interval of quiet in the Lebanese Civil War which took place from 1975 to 1990. Consequently, her father gave her the name Amal (Hope). Ramzi, Amal’s father, who got his Masters degree from the prestigious American University of Beirut, was the owner of the travel agency known as COMET while her mother, a popular political journalist, is the editor of the Pan-Arab newspaper, al-Hayat. She is also one of the brains behind the establishment of International Communication Experts, a public relations company predominantly in the Middle East. Amal Clooney has one sister named Tala and 2 half-brothers, Samer and Ziad, products of her father’s first union. During the civil war in Lebanon, Amal’s family moved from the country to Gerrards Cross in Buckinghamshire. Although she initially did not know how to speak the English language, she eventually learnt it by watching the show “The Facts of Life”. The Beirut-born lawyer attended a girls’ high school named Dr Challoner’s High School (DCHS), in Little Chalfont, Buckinghamshire, and later moved on to St Hugh’s College, Oxford, from where she graduated in 2000 with a degree in Jurisprudence. While at St Hugh’s, she earned an Exhibition, as well as the Shrigley Award. In 2001, she got into New York University (NYU) School of Law for her postgraduate academic degree (LLM degree) and as a result of her outstanding performance in entertainment law, she was given the Jack J. Katz Memorial Award for excellence. While still studying at NYU, Amal Clooney worked for a semester in the office of Sonia Sotomayor, who was a judge for the US Court of Appeal for the Second Circuit at the time. Qualified to practice law in the US, Amal was in 2002, admitted to the bar in New York. She has practised at the International Court of Justice and the International Criminal Court, among other international courts in The Hague. In New York City, Amal worked at Sullivan & Cromwell for three years. There, she was among the Criminal Defense and Investigations Group and had among other clients, Enron and Arthur Andersen. In 2010, the legal practitioner moved back to Britain and was admitted to the bar in England and Wales (Inner Temple) at Doughty Street Chambers. She has handled some cases which involved high-profile individuals and entities, such as the Cambodia state, Abdallah Al Senussi – former intelligence chief of Libya, Yulia Tymoshenko – a Ukrainian politician, and the founder and director of WikiLeaks, Julian Assange, among others. Apart from practising law, Amal Clooney is also a lecturer. She has taught in the Human Rights Institute of Columbia Law School where she is a visiting faculty member and a senior fellow. She has also lectured in a number of other schools, including the University of North Carolina at Chapel Hill, University of London, The Hague Academy of International Law, the Law School of the School of Oriental and African Studies and The New School. The international law and human rights lawyer has garnered an impressive net worth estimated to be $10 million (£7.4m) from her years of legal practice. However, her husband’s net worth is many folds more than that, precisely a whopping $500 million (£380.9 million), according to reports. 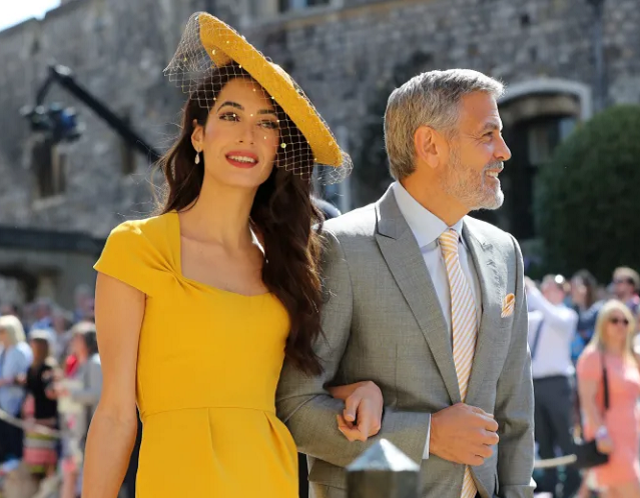 Two years and a few months after Amal and George Clooney’s highly publicized wedding, it was reported on the talk show, The Talk, which airs on CBS, that the couple was expecting their first babies, a set of twins. The information was also confirmed to Entertainment Weekly by the couple’s close friend, actor Matt Damon, and true to the news, Amal Clooney gave birth to a daughter, Ella, and a son named Alexander on the 6th of June 2017. In a bid to give their babies the quality attention and care that they need, the couple enlisted the services of celebrity-loved childcare expert Connie Simpson. The British/Lebanese citizen is drop-dead gorgeous, no doubt. She measures 5 feet 9 inches (175 cm) in height and weighs 54 kg (119 lb). She has brown eyes, dark brown hair and body measurements of bust – 34 inches, waist – 26 inches, and hips – 35 inches.